I’m working my way to the bottom of a large bag of Meyer lemons, picked before the recent cold spell set in. A glut of citrus fruit can be a kitchen challenge: how to use LOTS of lemons before they spoil? Poking around in the kitchen, I remembered my pre-Christmas purchase of an angel-food loaf pan. Long and straight as opposed to the typical tubular angel food pan, my new pan features raised corners. As angel food cakes cool in the pan, upside down, to prevent collapse, the raised corners allow air to circulate beneath the cooling cake. ( The feet are visible in the photo.) 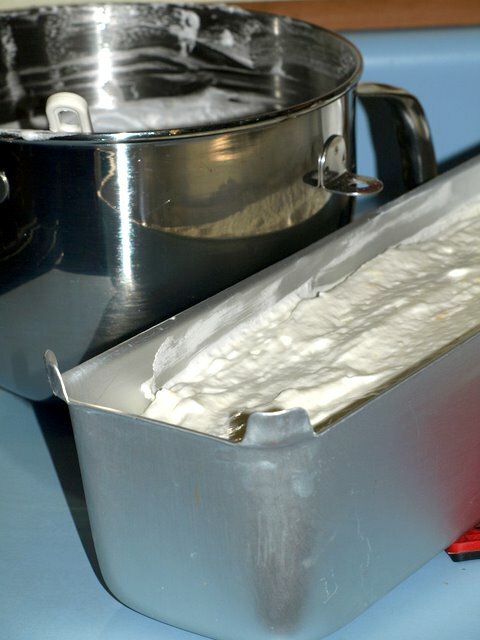 A smooth-cornered, unfooted pan would trap heat when inverted, causing the cake to toughen as it steamed. Traditional tube pans are inverted and hung on the neck of a bottle to prevent the cake from steaming as it cools. I decided to try out the pan, whipping up a classic angel food cake (recipe here), only with the addition of 2 tsps finely grated Meyer lemon zest. 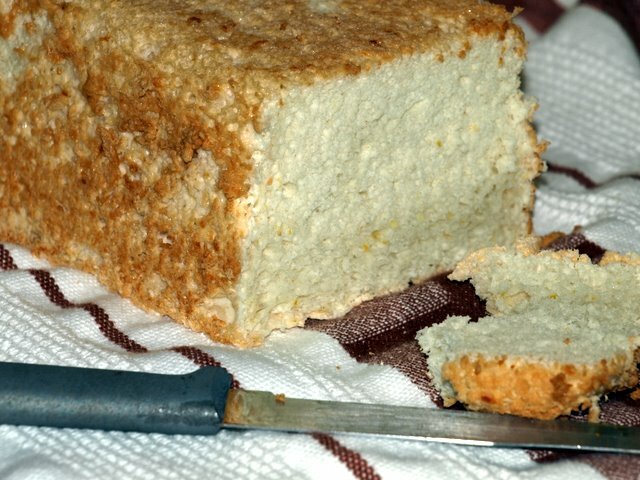 The resulting tender loaf was perfumed with fresh lemon, a good companion to a cup of Tazo’s Zen tea, a blend of green tea, spearmint, lemon verbena, and lemongrass. The cake’s texture was slightly more open than I expected, with a few larger holes. I used dried egg white powder, so I don’t know if the powdered whites didn’t completely dissolve, or if I folded the dry ingredients into the foam too vigorously. Despite the slight cosmetic blemishes, it was delicious.